Locals in Lawrence were invited to walk over the old bridge at Sportsmans Creek one last time by Clarence Nationals MP Chris Gulaptis. 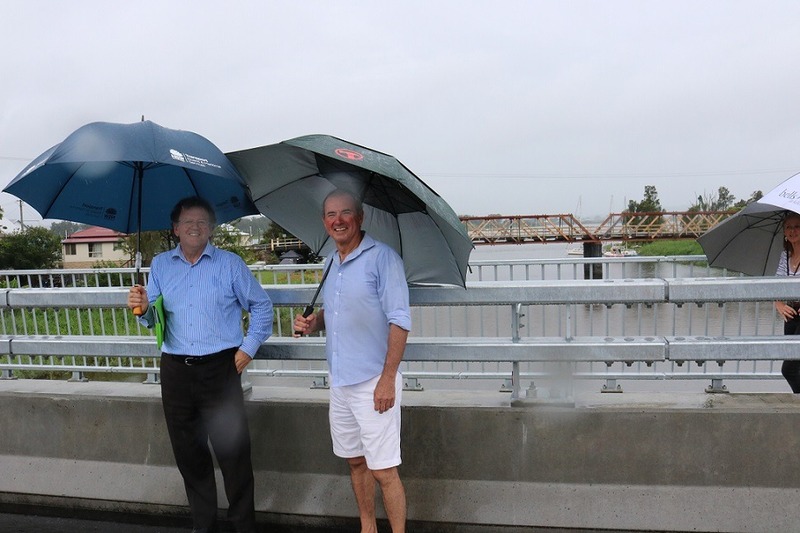 Mr Gulaptis said road safety and traffic flow had improved for motorists in Lawrence and the surrounding area since the NSW Government–funded $27 million concrete replacement bridge opened almost a year ago. Bats living in the existing timber structure have been relocated and the removal process is about to begin, including work on dismantling the deck and setting up temporary works to stabilise the timber truss spans. A large barge mounted crane will be used to lift and transport the truss spans and other bridge components downstream to Harwood docking station for disassembly. The timber is going to a timber salvaging company for reuse. Mr Gulaptis said the existing timber bridge had been closed since the opening of the new Sportsmans Creek Bridge. There are no planned activities on this day. For safety, the bridge is open to pedestrians only, vehicles will not be permitted. Access to the old bridge will be closed again from 5pm on February 10 in preparation for removal work to start. Mr Gulaptis said a work site was being set up for the removal project, which was expected to be complete by the end of April, weather permitting. “A time lapse recording will be made of the bridge removal and provided to the community as part of archival recording of the bridge,” he said. Work will be carried out Monday to Friday between 7am and 6pm and on Saturdays between 8am and 1pm. There will be some noise associated with the work, but every effort will be made to minimise the impact on residents.